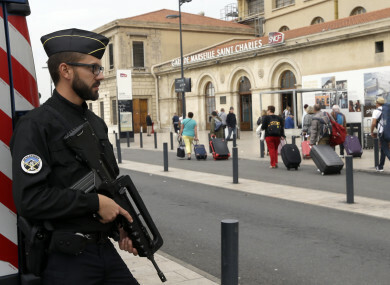 A police officer stands guard while passengers enter the Marseille Saint Charles train station, a day after a man fatally stabbed two women outside the train station. THE PARIS PROSECUTOR has opened an anti-terror investigation after the discovery at the weekend of a homemade bomb at a building in Paris and five people have been arrested, sources close to the case said. Police discovered two cylinders of gas in the hall of a building in the city’s 16th arrondissement and two others on the pavement. They also found a mobile phone linked to the cylinders, which appeared to be “a device to ignite” the explosive, the sources said. A resident alerted police after finding two of the gas cylinders around 4.30am (3.30am Irish time) on Saturday in his building in the Porte d’Auteuil neighbourhood, a source close to the probe said. Police then found the other two cylinders outside the building. According to another source, five suspects were being held in custody last night. The terrorist threat remains high in France, which has been hit with a series of jihadist attacks since January 2015. The latest attack was on Sunday in Marseille when a knifeman stabbed two women to death at the main train station shouting “Allahu Akbar” (“God is greatest”). He was shot and killed by soldiers. The stabbings bring to 241 the number of people killed in jihadist attacks in France. On 12 September, French Interior Minister Gerard Collomb said that 12 planned attacks had been foiled since the beginning of the year. Email “Five arrested after discovery of homemade bomb in Paris”. Feedback on “Five arrested after discovery of homemade bomb in Paris”.